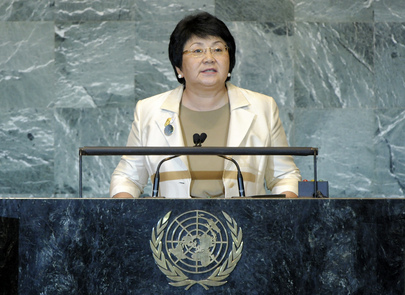 ROZA OTUNBAEVA, President of Kyrgyzstan, said major changes faced the world today, including the ongoing financial crisis and the crises in North Africa and the Middle East. One year ago, her country had transitioned to a parliamentary form of government. Now Kyrgyzstan was reforming its judicial system and would, next month, hold presidential elections. The effort it had made towards democracy was now at the centre of world attention, and there was no place for a division according to religious, cultural or other lines. She invited Member States to send observers to Kyrgyzstan for the upcoming elections, emphasising that the path from dictatorship to democracy was a long process. She added that billions of dollars had been taken out of her country, and dictators should face consequences and not find asylum abroad. She said that establishing peace and enhancing governmental power now depended on the pace and methods used to address social and economic problems. Among those means was mediation for conflict resolution, which should include women, who were responsible for establishing peaceful social life. Women effectively imposed peace, as was the case in her country, where women were present in many professions and represented one third of Parliament’s members. On other topics, she was concerned about the drop in international attention to the issues of climate change. Concerning the Arab-Israeli conflict, Kyrgyzstan had joined the appeal made by the Secretary-General to Israel and Palestine to return to the negotiating table. The two must become good neighbours, with both enjoying peace and security. Kyrgyzstan had put forward its bid for a Security Council non-permanent member for the coming term, in its support for the broadest representation of Member States on that body. She concluded by focusing on youth, saying that young people should be supported during the current historical changes and technological progress, as they were their country’s present and future.